Jacksonville is located in Jackson County a few miles west of Medford, near the Rogue River. Founded in 1852, Jacksonville's collection of preserved pioneer buildings is the result of the 1860's halt in development. With mining activity waning, Jacksonville became a trade center for agriculture. 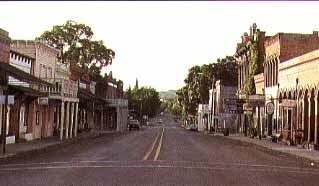 The town's growth was stopped again when it was bypassed by the Oregon and California Railroad in 1884. The town is now known for it's Britt festivals, featuring folk, classical, and jazz music. In the surrounding hills are remnants of gold mining, a wonderful, old covered bridge, hunting, fishing, hiking, a small prize-winning vineyard, and some of the most beautiful countryside in Southern Oregon. There is also a Jacksonville, Maryland. Jacksonville is part of the Medford-Ashland, Oregon metro area.